We have seen the first signs of winter weather, and that means Colorado drivers have to start commuting in these variable conditions from time to time. There are a few tips and reminders that we would like to share with you as you hit the roads this winter so you can be as prepared and safe as possible. Carry extra blankets, a flashlight, a shovel and even some snacks/water. Fill up on windshield wiper fluid rated for low temperatures. Get a tune up on your car and make sure everything is working properly. Keep your gas tank over half full. In times that you are stranded, having heat and power will be important. Keep a stock of snow removal products; salt, kitty litter etc. All-season Tires– These tires are ideal if you live in a warmer climate that doesn’t see much snow fall, and icy road conditions are rare. Although these tires are designed to provide traction in wet and slippery conditions, they may not be enough for icy and snowy roads. Winter Tires– If you live in a climate that sees snow every winter, as well as icy road conditions, winter tires are probably for you. These tires are designed with special tread meant to drive in all sorts of winter conditions including, snow, rain, sleet, and ice. 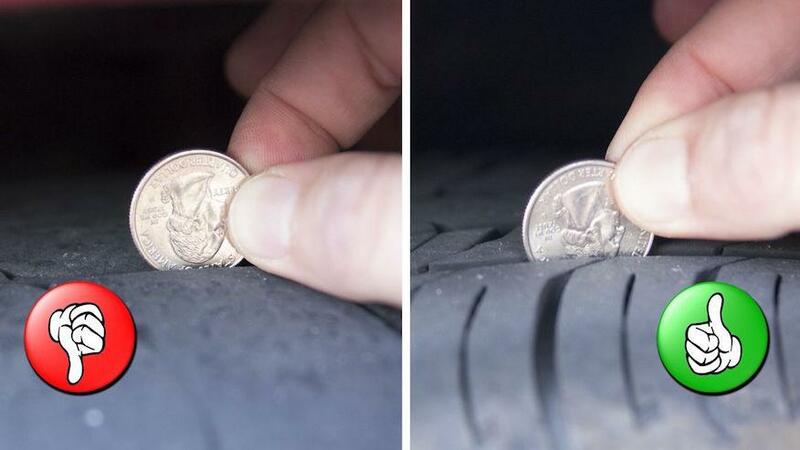 Another important thing to consider when evaluating your tires for the winter weather is the amount of tread left on them. The Colorado Department of Transportation recommends doing a “Quarter Test” to check if you need new tires this season. The goal is to have a depth of 1/8 inch in your tread, as this is the minimum requirement when Traction Law is in effect. Above, you see an example of a worn out tire, and a tire that still has good tread. If you can see the top of George Washington’s head when the quarter is inserted in the tire tread, it is probably time for some new tires. If the top of Washington’s head is still hidden by the tread, then you should have close to 1/8 inch depth. Avoid passing on the right side of a snow plow. Snow plows are designed to push all the snow on the road off to the right. Trying to pass an active snow plow could not just damage your vehicle, but also cause you to lose visibility temporarily. Make sure you leave plenty of room between yourself and the snow plow. You never know when a plow will have to come to a sudden stop. Also, plows are often times dropping sand, salt or other materials to break down ice on the road. If you are following too close, this debris could cause damage to your car. It is important to remember that even if your car has 4-wheel drive, or all-wheel drive, that doesn’t necessarily mean that your vehicle can break any faster than 2-wheel drive car. Different road conditions can affect your reaction time, as well as the amount of space needed to ensure your vehicle comes to a complete stop. When driving in adverse Colorado conditions, please leave yourself plenty of distance between you and the car in front of you, and plenty time to get where you need to go.